Thunderstorms are severe weather phenomena observed almost everywhere around the globe. Their destructive potential is limitless, causing a variety of problems in aviation, communications, transportations, agriculture, stock raising, construction and all human activities in general. Their main characteristics are the heavy rainfall or/and hail, the strong horizontal and vertical winds throughout the whole troposphere and the cloud electrification that leads to lightning discharges. 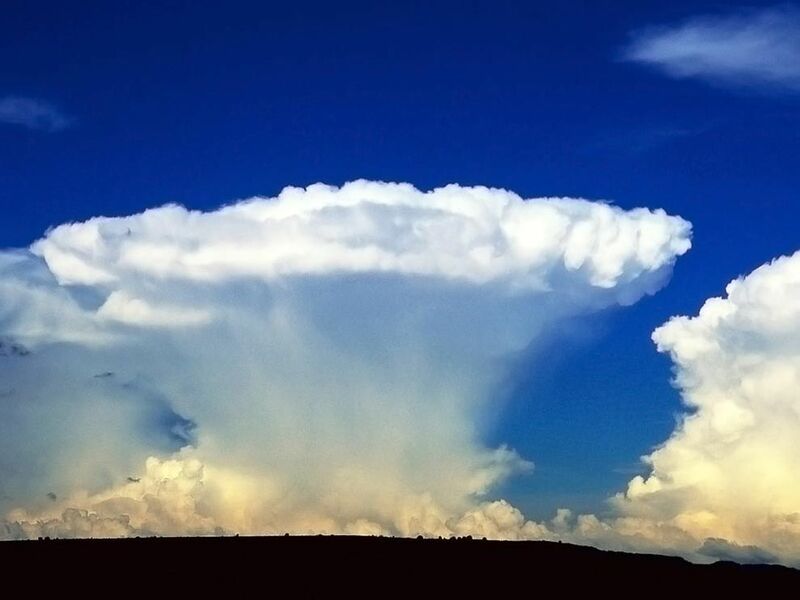 The heart of the thunderstorm is a warm humid air mass that is rising and expanding rapidly, forming a very tall cloud named Cumulonimbus (Cb). The expansion continues until the available energy depletes or the stratosphere is reached and penetrated. But why should such an air mass start to rise? There are a lot o reasons that could trigger such a movement. The surface overheating during the warm hours of the day is one. The air close to the ground warms up significantly and becomes warmer and lighter than its surroundings. As it rises it releases latent heat when condensing the water vapor it contains. This latent heat contributes to the temperature difference and helps in the conservation of the lifting motion. Another reason to start an upward motion is the forced overcoming of an obstacle. When air masses for example move towards a mountain, they are partially forced to start rising. If this movement is enough to result to the first condensation of water vapor, then latent heat is released that may sustain or strengthen the upward motion. Regardless the triggering effect, as long as the upward motion is conserved, cloud drops, graupels and ice particles are formed the Cb cloud is continuously expanding. There are 3 distinct stages in the life-cycle of a thunderstorm: the development, the mature stage and the dissipation stage. The development stage begins when the moist air mass begins to ascent. During this stage the Cb is not fully developed yet and has the characteristics of a cumulus cloud rapidly developing to the form of a towering cumulus. The surface wind field under the cloud is not strong and usually no rainfall is observed. Some lightning may occur after a significant part of the cloud reaches temperatures below 0oC. This stage lasts up to 20 or 30 minutes at most of the cases. The mature stage begins with the first raindrops that leave the Cb cloud. The cloud drops and hail pellets become very heavy and the upward air motion inside the cloud cannot hold them anymore. They fall producing heavy rainfall of hail to the areas below the cloud, which is accompanied by strong downdrafts. These downdrafts are developed during the raindrop and hail pellets drop. During that, a part of them is evaporated consuming thermal energy from their environment thus cooling it and make it heavier. This cold and heavy air starts to fall to the ground producing strong downdrafts and surface wind shear. The updraft and the downdraft coexist inside the cloud during this stage of the storm. Large amounts of rainfall or hail reach the ground, while most of the lightning activity is exhibited during this stage too. As soon as the downdraft prevails over the updraft, the dissipating stage begins. The rainfall or hail weakens significantly and since the updraft is also weak, the top of the cloud is carried away by the upper level winds forming the anvil of the cloud. Soon the rainfall stops completely and the thunderstorm is considered to have completed its life-cycle. There can be various types of thunderstorms that present different features regarding their life time duration, horizontal area and strength. The five generic types that can cover almost all thunderstorm cases are the single-cell thunderstorms, the multi-cell thunderstorms, the squall lines, the supercell thunderstorms and the Mesoscale Convective Systems (MCS). The single-cell thunderstorms are the weakest of all. They consist of a single Cb cloud which usually completes its life cycle in a total time of no more than two hours. They often occur during the warm hours of the day and are triggered by the surface overheating. The rain or hail that they produce can be significant but rather local and so is the lightning activity that accompanies them. When a collection of nearby single-cell thunderstorms interacts, they may form what is called a multi-cell thunderstorm. In such a storm, new updrafts are formed at the edge of downdrafts of other thunderstorms. In this way the dissipating or mature storms can feed the updrafts of new cells and give birth to or strengthen new thunderstorms. When a group of thunderstorms form a virtual line then we have what is called a squall line. Squall lines are formed often along cold fronts and therefore are narrow but elongated entities that pass relatively quickly over the areas they sweep. Although, the duration of impact for each separate area is small the squall line can last several hours and affect vast areas along its path. The supercell thunderstorm is a kind of thunderstorm that presents special dynamical features. It is a very violent thunderstorm that produces heavy rain, hail and lightning and can also give birth to tornadoes. When a collection of neighboring thunderstorms interact and form entities that look like massive storms that affect wide areas then they create what is called a Mesoscale Convective System (MCS). An MCS can last up to 12 hours or more and produce heavy rain, hail and lightning. In some cases the MCS can appear as a collection of clusters of cells and not as a unified entity.